Recalling that KCR had served as a minister in the UPA government, Modi said the TRS chief did his 'apprenticeship' under the Congress. 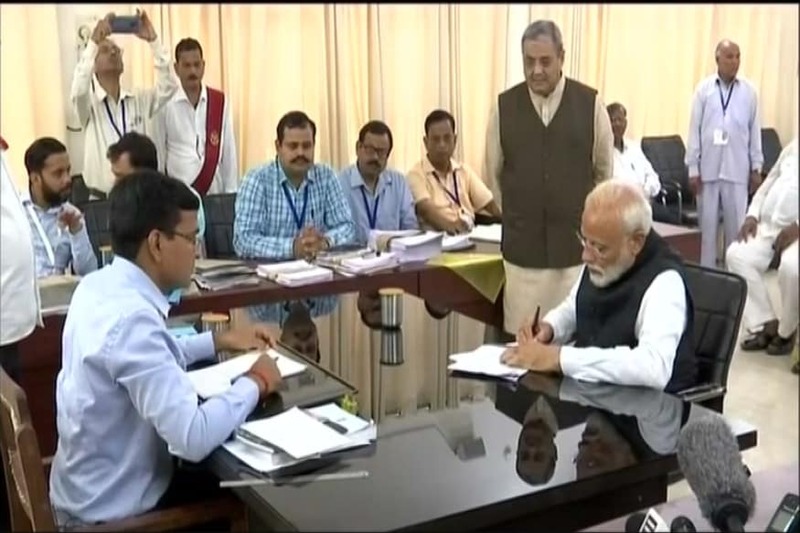 Nizamabad: Telangana saw a pitched battle on Tuesday between Prime Minister Narendra Modi and caretaker chief minister K Chadrashekar Rao as both the leaders levelled allegations against each other. Accusing the TRS and Congress of perpetuating family rule, Modi said the two parties were playing a “friendly match” in Telangana elections. In his first election rally in the state, the Prime Minister reaffirmed the BJP’s commitment to inclusive growth. “The chief minister of Telangana and his family thinks they can get away with doing no work like the Congress.... They have adopted the style of the Congress which ruled for 50-52 years without doing anything. But that cannot happen now," he told an election rally in Nizamabad, as he took the poll battle to Rao’s turf. Nizamabad is represented by Rao's daughter K Kavitha in the Lok Sabha. Recalling that KCR had served as a minister in the UPA government, Modi said the TRS chief did his “apprenticeship” under the Congress. “Congress and TRS are two faces of the same coin. Both parties are competing against each other on who tells more lies. TRS and Congress are family-ruled parties playing a friendly match in Telangana polls," he said, adding that it was a “big joke” that UPA chairperson Sonia Gandhi and Congress president Rahul Gandhi assailed the TRS for being a “family party” at an election rally last week. The PM said Rao’s decision to go for early elections could give people an opportunity to “get rid of him before time”. He said Rao did not join Ayushman Bharat scheme under which the Centre would bear medical expenses of the poor to the extent of Rs 5 lakh a year because of his feeling of insecurity. “This CM feels so insecure...he trusts astrologers, does puja, ties nimbu-mirchi (to ward off evil). So when we introduced Ayushman Bharat Yojana, he decided not to join it. He feared people will reject him if Modicare comes into force. He did injustice to the poor people of the state,” Modi said. As he accused the TRS government of not keeping its promises made to youth, farmers, Dalits, tribals and backward classes, Modi asked the voters to teach the party a lesson. The PM said the chief minister had once asserted he would transform Nizamabad into a smart city like London but the place was still grappling with shortage of water, electricity and proper roads. “The CM once said he would ensure the water of the Godavari river reaches every household or else will not seek votes. Has it happened? The man who cannot provide people with even water doesn't deserve to be given power,” he said. Hitting back at Modi, KCR said he should “not lie for the sake of votes". Rao also claimed that Modi and Andhra Pradesh Chief Minister N Chandrababu Naidu conspired to destabilise the TRS government during the early days of formation of the government and impose President's rule. "What kind of Prime Minister you are I don't understand. How can you speak such a lie... You should not lie, being in the responsible post of prime minister, for the sake of votes. If you want I will come to Nizamabad now. We will ask people," Rao said addressing an election rally in Mahabubnagar district. "Mr Narendra Modi, there is no power problem in Telangana... don't lie. I am very sorry to say this. You cannot level allegations against a chief minister. I am not afraid of anyone. I am not (Andhra Pradesh Chief Minister N) Chandrababu Naidu," Rao said, reiterating that there was a need for a "federal front government" at the centre. Rao claimed that Telangana was the only state in the country where farmers were supplied power round-the-clock and asked Modi if the BJP-ruled states were providing 24-hour electricity to the farm sector. Reacting to Modi's remarks on Congress and TRS are "two side of the same coin," Rao said he is bold enough to admit openly that TRS and AIMIM work together as both of them belong to Telangana. On Modi's comments that Rao feels insecure and that's why he takes shelter in astrology, poojas, yagnas and others, the TRS chief questioned Modi as to why he should have any problem with his activities. "I believe in them. I will be happy to share prasadam if you come... I believe in God and that's why perform poojas. If you are sincere, tell Telangana people as to why you have stopped increase of quota (a proposal sent by the Telangana government) for Scheduled Tribes in tune with their population, the caretaker chief minister said.